(CNN) -- Husbands are allowed to slap their wives if they spend lavishly, a Saudi judge said recently during a seminar on domestic violence, Saudi media reported Sunday. 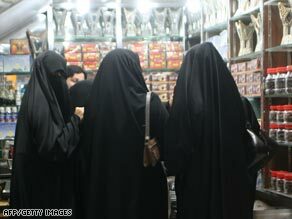 It is OK to slap Saudi women who spend too much, a judge has told an audience. Arab News, a Saudi English-language daily newspaper based in Riyadh, reported that Judge Hamad Al-Razine said that "if a person gives SR 1,200 [$320] to his wife and she spends 900 riyals [$240] to purchase an abaya [the black cover that women in Saudi Arabia must wear] from a brand shop and if her husband slaps her on the face as a reaction to her action, she deserves that punishment." Women in the audience immediately and loudly protested Al-Razine's statement, and were shocked to learn the remarks came from a judge, the newspaper reported. Arab News reported that Al-Razine made his remark as he was attempting to explain why incidents of domestic violence had increased in Saudi Arabia. He said that women and men shared responsibility, but added that "nobody puts even a fraction of blame" on women, the newspaper said. Al-Razine "also pointed out that women's indecent behavior and use of offensive words against their husbands were some of the reasons for domestic violence in the country," it added. Domestic violence, which used to be a taboo subject in the conservative kingdom, has become a hot topic in recent years. Groups like the National Family Safety Program have campaigned to educate the public about the problem and help prevent domestic abuse. Saudi women's rights activist Wajeha Al-Huwaider told CNN that Saudi women routinely face such attitudes. "This is how men in Saudi Arabia see women," she said in a telephone interview from the Saudi city of Dahran. "It's not something they read in a book or learned from a friend. They've been raised to see women this way, that they're less than a person." Al-Huwaider added that "I'm not surprised to see a judge or a religious man saying that - they've been raised in the same culture - a culture that tells them it's ok to raise your hand to a woman that this works." Another Saudi judge, in the city of Onaiza, was the source of a separate recent controversy: he twice denied a request from the mother of an 8-year-old girl that the girl be granted a divorce from her 47-year-old husband. Last month, after human-groups condemned the union, the girl was granted the divorce.